Tommy is just about to start the 4th grade. He should be excited to be in Southern California this summer, but nooooo, his dad moved the family from Milwaukee and away from all of Tommy’s friends. Tommy is bummed out, until one day when he discovers the new mystery in his life: a filthy, floppy-eared homeless dog, who has apparently just fallen from the sky! Now available in a coloring book!! We have one to giveaway!! 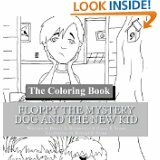 One winner will win a coloring book! Leave a comment below letting us know you are entering! Then, like the Floppy Facebook Page by clicking here! You can let them know we sent you! 🙂 Deadline to enter is October 30th, 2013! One winner will randomly be selected from all entries! my daughter loved this book! cute idea for a Christmas gift! already liked Floppy’s page! Love this story! just ordered the story this week and can’t wait to read it!